Double action pain relief + caffeine.For rapid relief of general pain such as migraine, period pains, rheumatic and muscular pain, toothache, sore throat, nerve pain and the symptomatic relief of colds and flu. Please read the enclosed leaflet carefully. 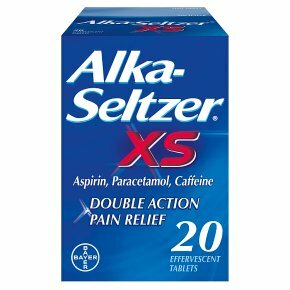 Directions: Alka-Seltzer XS should always be dissolved in water before use. Dosage: Adults: 2 tablets every 4 hours, if necessary. Maximum dosage: Do not take more than 8 tablets in 24 hours. The dosages should not be continued for more than three days without consulting your doctor. Do not give to children aged under 16 years, unless on the advice of a doctor.